Learning, taking notes and repetition. Recently my friend, Lisa Chin came to NYC and we had two art playdates. 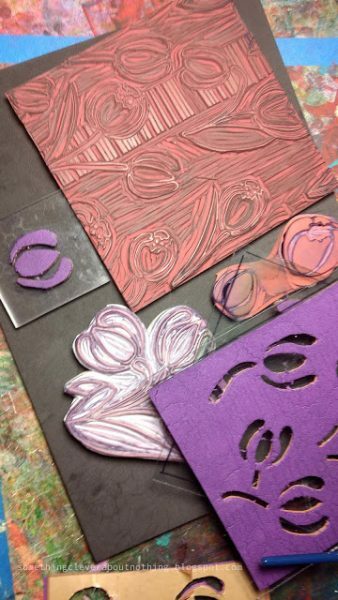 Lisa is a fantastic printmaker and carver. Check out her website and her insta! 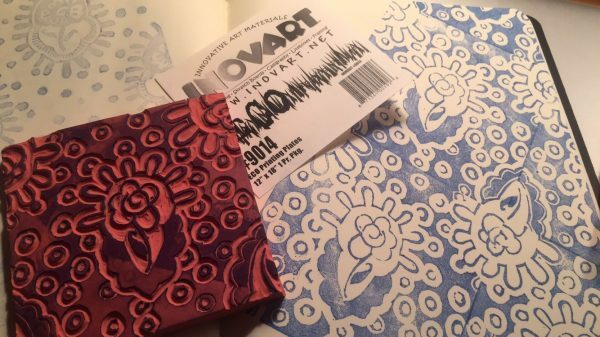 In playing together, Lisa wanted me to try out Inovart Eco Karve (and some paints too, though that is a post for another day). So, I tucked in and took some lessons. As I did so, of course, I took notes in my Moleskine. In the Moleskine, I printed a strike-off (page 31, Playful Fabric Printing), made notes about the carving rubber itself. Then in true Melly style, I decided to carve several similar designs so that I could further improve my skill set within this new carving medium. Repetition helps build muscle memory and similar imagery gives me time to explore similar lines and carving approaches. I printed them off using the same colors in order to evaluate them side by side. I think the white serves this design well in both versions. I am partial to the white dots at top right, but think both benefit by judicious use of white. White is often a bully of a presence in printed fabric, I feel this use of white creates balanced ‘pop’. I will write notes about this too! As I create motifs and print, keeping notes along the way allows me to keep up with myself. I have been doing it for long enough that I have 4 journals worth of juicy notes. 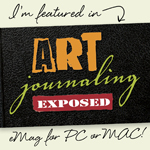 As a resource, dipping into these journals is really helpful. It can help shift your perspective on current work, provide new ideas, remind you of a new art material or perhaps a playdate with a good friend. Do you take notes and track your creative efforts? Leave a comment and tell me what you do. 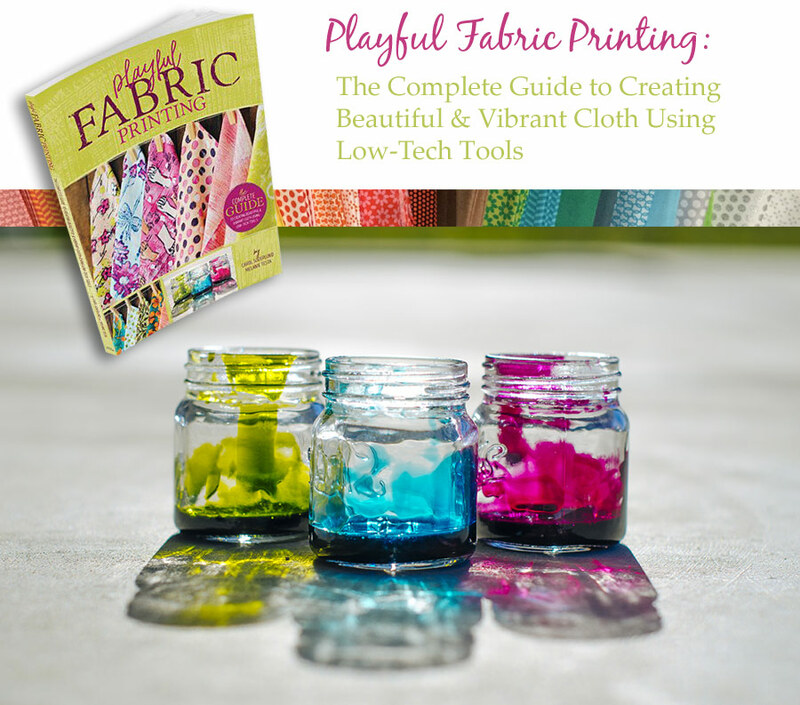 As you know, Carol and I are hosting a blog hop to celebrate the release of our book, Playful Fabric Printing. Today’s post is a Round Up of each participant on the hop, with stories of how we met, why we chose each person to participate with links to their websites and social media hubs. 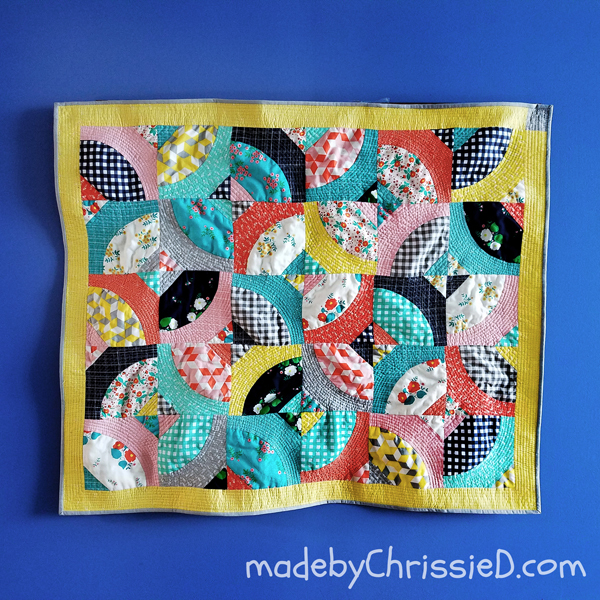 I highlight four hoppers on my blog and Carol is highlighting the other four on her blog. Lisa Chin and I met through social media and have become in-person friends as a result (who doesn’t love making friends in this way?). Lisa’s web presence is called Something Clever about Nothing, a pithy and fun name for the great explorations found within it. 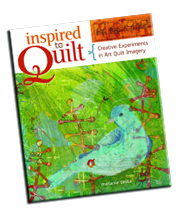 Lisa has published articles on topics pertaining to Gelli Plates and Sun Printing, has contributed to books on Zen Doodles, and made an appearance on QATV series 1700. I have been watching Lisa grow and expand her skill set and I am amazed by her commitment to the progress, she has made such strides in such a short time. Please follow Lisa on Facebook, insta and Pinterest. 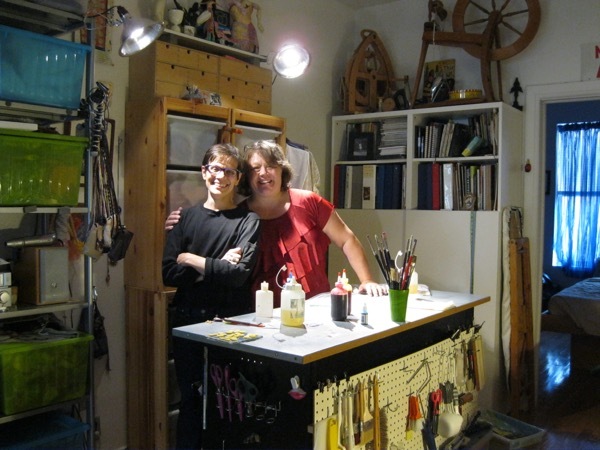 Judy Coates Perez and I met in the green room on the set of Quilting Arts TV many years ago. We have become teaching roomies whenever we travel to the same event. 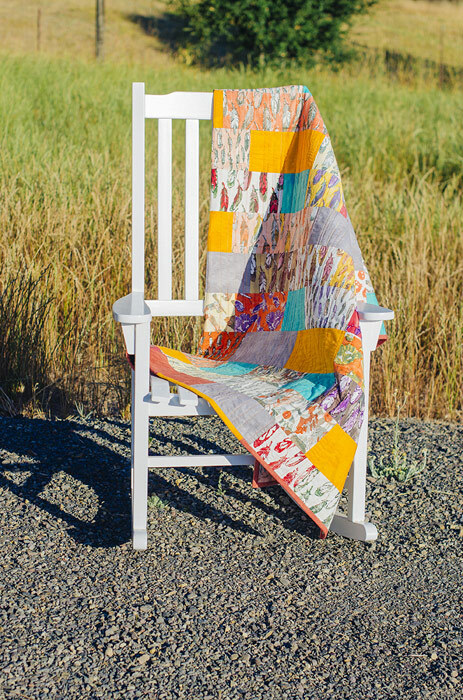 I have come to love her like a sister and can honestly say her daughter, Indigo, is just as talented as she is (Indigo Perez was the photographer for Playful Fabric Printing and her photos are luscious). But, back to Judy… Judy’s art is amazing. Although I have visited Judy’s home twice, this last visit was the first time that I have touched both these pieces of art. The detail Judy is able to convey is amazing. 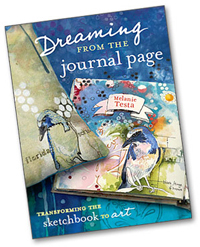 Judy has self published two books, both of which I highly recommend, Alternatively Bound and Stitched and 10+ Techniques with Acrylic Inks. Please follow Judy on Facebook and insta. Chris Dodsley, whose brand is Made by ChrissieD, is a local friend and fellow member of NYC Metro Mod Quilters. Chris is a firebrand of creativity and is quick to contribute to Call For and requests for help. Each time I have made a call for help in our community, Chris is ready and willing. Her work is strong, her voice sings through and her presentations and images are tight and professional. Well they should be, as Chris is a sample maker for fabric companies that we all know and love! 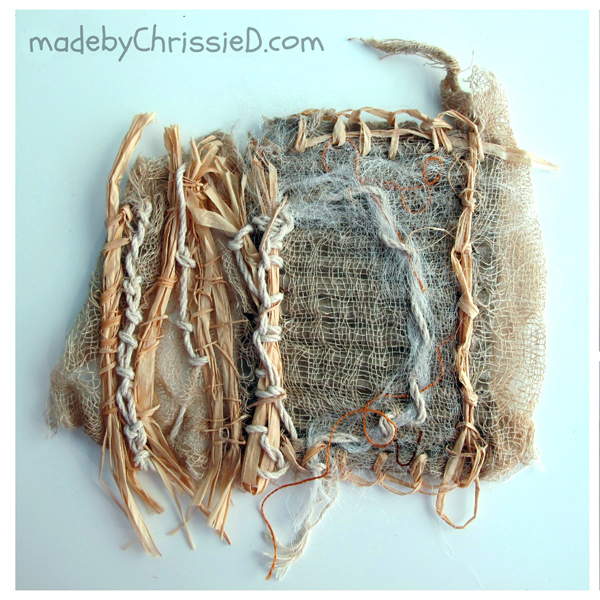 Chris has been blogging for a long while and has some great tutorials on her site. Please friend her on Facebook, insta and Pinterest too! And now, we turn to Pokey Bolton. Patricia Chatham Bolton, that is. For this stop on the blog hop, I may just go a bit poetic. I first met Pokey while attending Quilt National 2007. Where Repose had gained entry. While there, Pokey asked to speak with me and proceeded to ask if I might be interested in writing a book based on the techniques used in my winning entry. I said yes, and Inspired to Quilt is the result. In preparing to write this post I asked each Blog Hopper for two photos to feature in this post. I told each that it could be of a connection between us or it could be a favorite project. Pokey sent this image of ‘The Gang’, or rather from left to right: Jamie Fingal, Judy Coates Perez, Leslie Tucker Jenison, Pokey Bolton, myself and Jane LaFazio. This is a small grouping of Pokey’s Angels. 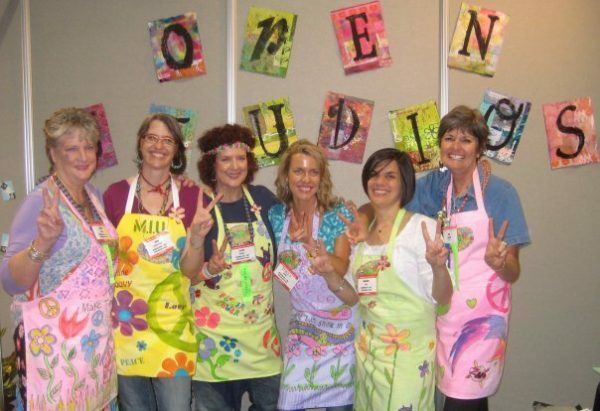 Pokey’s Angels, as I am currently calling all of us, is an ever growing, expansive and amorphous group. I am unsure, but I think this is Long Beach 2009? Correct me if I am wrong. Anyway. 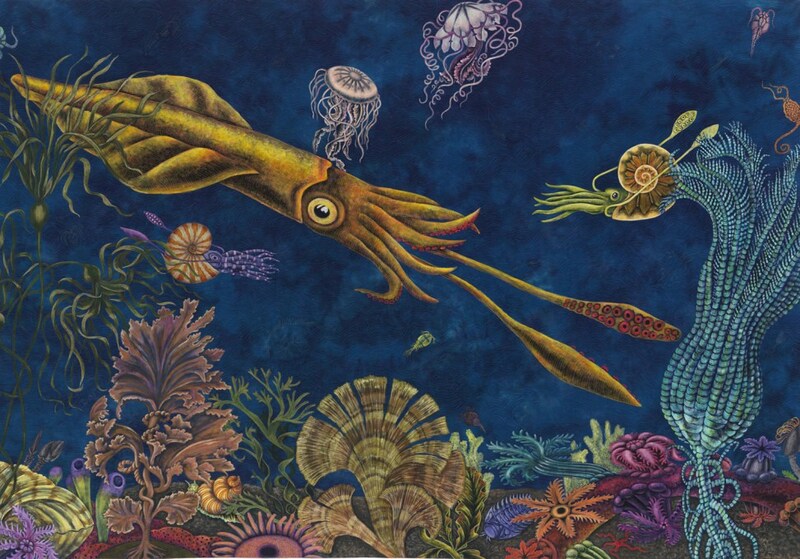 Pokey brings together people of diverse artistic background. She gathers people up and creates events, publishes magazines and books, Pokey is a passionate whirlwind of great accomplishment. When Pokey asked if Carol and I might be interested in publishing with her, we felt honored. Honored to earn Pokey’s loyalty. Honored to trust that Pokey would make our content shine. I am confident in saying that every person in the Long Beach photo would say the same were they in our shoes. and we recreated the photo from so many years ago. 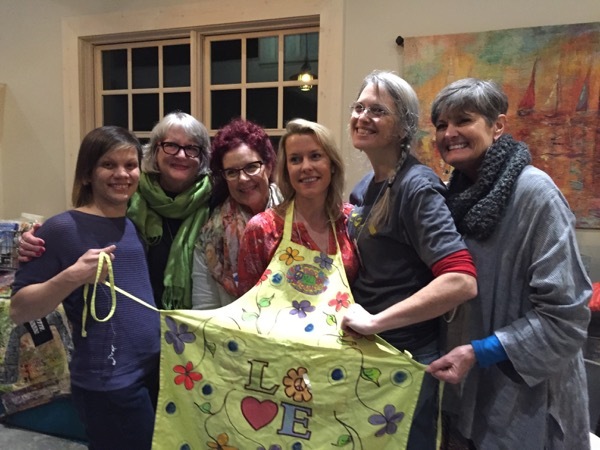 The second annual Craft Napa Retreat just unfolded, read Pokey’s recap here. I am happy to say, I want to return to Napa to experience Craft Napa retreats for years to come. In the meantime, Pokey began publishing again! 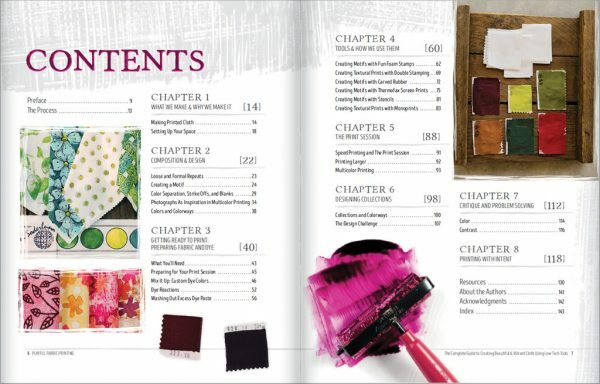 Playful Fabric Printing, coauthored with Carol Soderlund is Pokey’s first title under the name, Crafting a Life, LLC. I know as an author, I am tooting my own horn here? But tootin’ needs to happen. This book is photo and content rich. There is a 28 color triangle of repeatable color, in 4 values, combined with thoroughly tested techniques including the use of Fun Foam, Carving Rubber, Stencil and Thermofax Screens. 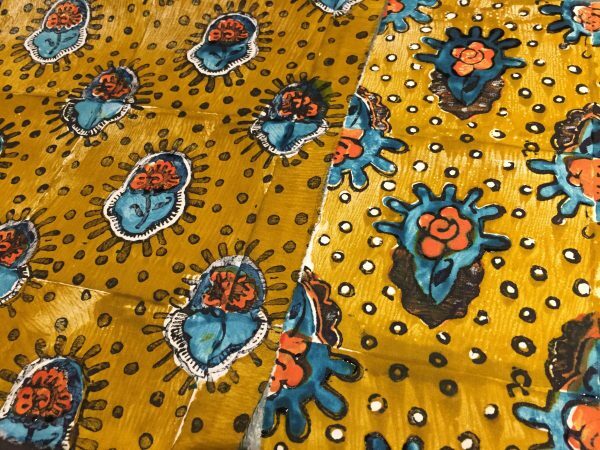 We present all of the information with an eye toward small space printing, because we know that many of us do not have gads of studio space in work in. Then we go on to present six quilts made with handprints! This book is huge! And pretty. And it feels nice. It’s a dream come true. Also? Playful Fabric Printing is published in the U.S.A. <—— This is really important. Pokey has chosen to employ U.S. workers to provide her content. A win for everyone! 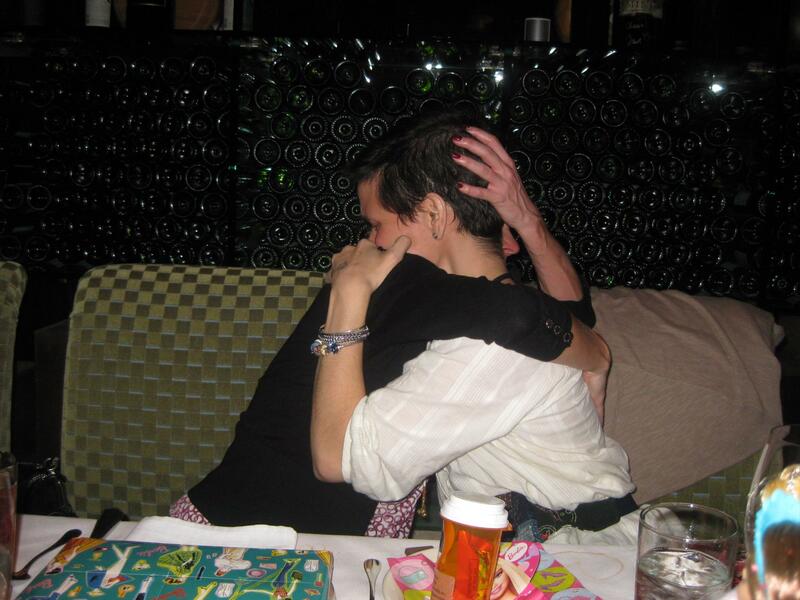 This tender photo was taken at Houston Quilt Festival a few years back, when a group of ‘Angels’ honored Pokey’s 40th. We met up for a dinner that included friendship, dressed up Barbie dolls, wine, awesome food, and a whole lot of love. Every time I look at this image, I mist up. It was my first Festival after a year long slog of breast cancer treatment. I went for no other reason than to be among friends and give myself a treat. And to heal. Because that is what we do for one another. As friends. And community. The very thing Pokey is so good at creating. This picture, these memories, and so many more, encapsulate what Pokey means to me. Thank you Pokey. 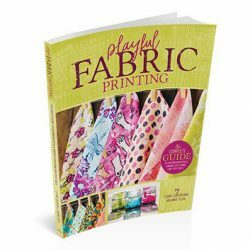 Remember, each blog hopper will give away a copy of Playful Fabric Printing, you must comment on that post to enter your name in the giveaway. Comment on every post!! (Most hoppers will close comments in one weeks time, which brings us to February 7. Check each blog for specific dates. My blog comments will remain open until the 7th). Please keep hopping!! 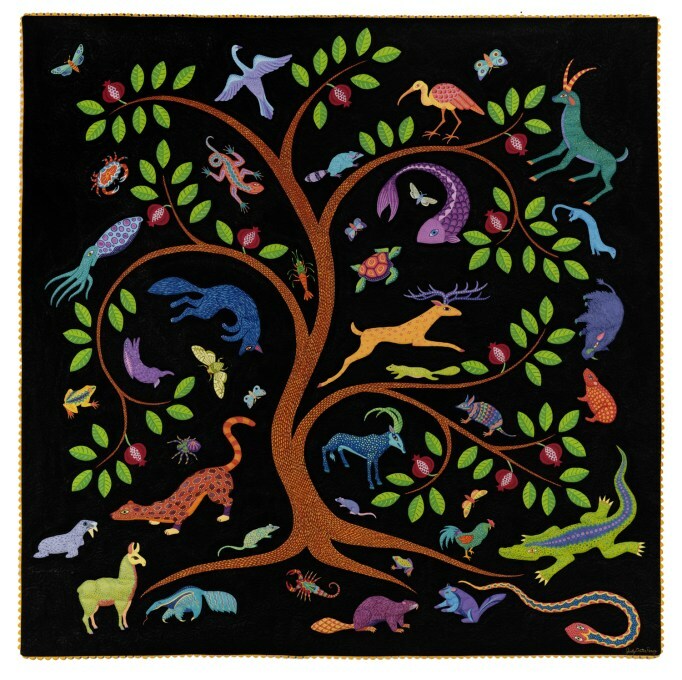 ALSO: Carol and I have also begun a Playful Fabric Printing Facebook Community page and would love for you to join. This will be a space for you to share images of work inspired by the pages or our book, ask questions, receive feedback and participate in print-alongs.